- The head of the Directorate of Military Aviation at the War Office in London today authorizes the expansion of the Royal Flying Corps, which currently stands at thirty-one (fourteen in France) squadrons, to sixty, with squadron strength increasing from twelve to eighteen. In France these squadrons are to be formed into brigades, with the ultimate aim of having one brigade tied to each army of the British Expeditionary Force. - As the German 11th Army was overrunning Serbia, the Russian high command had struggled to do something to aid its ally, General Alexeiev being cognizant that having complained of French and British inaction during the Great Retreat of the summer, the Russian army could hardly do nothing when the situation was reversed. Prompted by officials at the foreign ministry, he had deployed a new 7th Army on the Black Sea Coast, intended for amphibious operations against the Black Sea coast. The Russian navy, however, had vetoed the project, and so today Alexeiev orders 7th Army redeployed to eastern Galicia and begin planning, with 9th Army, for an offensive against the Austro-Hungarian armies opposite. In addition to 'doing something', there is a vague confidence at Stavka that the Austro-Hungarian army, having shown its inability repeatedly during the war, will collapse, and perhaps a victory here will convince the Romanians to join the war on the side of the Entente. - Given the lack of reinforcements, General Sarrail feels that his position in southern Serbia is not tenable, given that the Bulgarians significantly outnumber his force. Further, the ongoing collapse and retreat of the Serbian army negates the rationale behind his operations in the Vardar River valley. As such, today he issues orders to the three French divisions in southern Serbia to withdraw south. - Overnight elements of the Austro-Hungarian 4th Mountain Brigade launch an attack to regain the small stretch of the line that remains in Italian hands after their capture of it on the 20th. Their assault, however, runs smack into an Italian advance of their own; the two attacking forces mutually repulse each other, both falling back to their starting positions. - An Austro-Hungarian squadron of the light cruisers Helgoland and Saida plus escorting destroyers sortied towards the Straits of Otranto overnight, aiming to interrupt the Entente transport of supplies across the Adriatic Sea to the Serbs via northern Albania. They intercept two Italian ships - the motor schooner Gallinara and the small steamer Palatino - carrying flour and sink both. - The Russian dreadnought Imperatritsa Maria, escorted by the cruiser Pamiat Merkuriya and ten destroyers, bombards the Ottoman port of Zonguldak, the first occasion in which the new Russian warship fires its guns in anger. 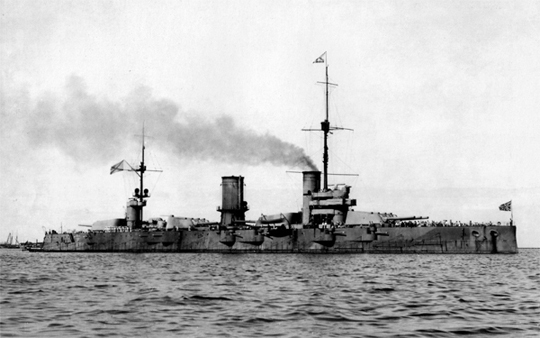 The Russian dreadnought Imperatritsa Maria.